As it is the last day of the month, this is my last chance to feature recipes from Charmaine Solomon’s The Complete Asian Cookbook, this month’s feature cookbook on The Cook Book Guru. Last week, I was flicking through Charmaine’s book looking for recipes to try. There are so many, it was very difficult to narrow down the choice. Now, as I have mentioned before on this blog, we have demarcation lines in the kitchen: Maus makes all things that need to be shaped into even-sized items. I don’t know how this happened but I am guessing one day she got so frustrated with my odd and uneven shaped patties, she decided it was time to take control. Coincidently, or perhaps purposely, the three recipes I selected were all within Maureen’s domain. Perfect! From the short list, we chose the Eastern-Style Croquettes that featured in my last post. But then the next day, we needed some nibblies for guests and, as the other recipes on the shortlist were fresh on our minds, we decided on one of them: meat and coconut patties (Rempah-rempah). As Maus finished shaping them, she declared that she would make these any day as compared to the croquettes. You can gather from that comment they were not anywhere near as labour intensive. They were also very tasty. The coconut flavour certainly dominates. 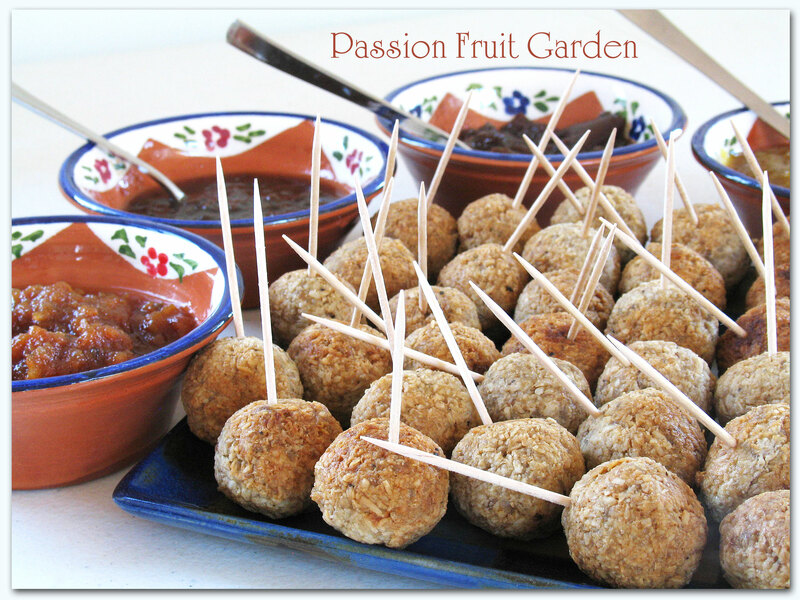 We served our little balls with a variety of fruit chutneys and they worked a treat. We made about 70 balls. Put the coconut into a bowl, add 125mls hot water and mix until the coconut is moistened. Put the moistened coconut into a large bowl with the beef. Put the shrimp paste in a small bowl and crush with the back of a spoon, then add one tablespoon of hot water. Mix until the shrimp paste is dissolved. Add the garlic, pepper, coriander, cumin, kencur powder and egg to the shrimp paste and mix well. Pour the mixture over the meat and use your hands to mix all of the ingredients together until well combined. Shape into small balls. Cover and refrigerate for, at least, 1 hour. Heat the oil in a wok or large pan over medium heat. When the oil is hot, deep-fry the balls, in batches, for 3–4 minutes, turning regularly until brown on all sides and cooked through. This entry was posted in Dips, Nibblies etc and tagged Indonesian meatballs, Meat and coconut meatballs, Rempah-rempah by Glenda. Bookmark the permalink. Hello again from our winter outpost in the delta of the great Colorado river here in the land of idiot voters (Yuma, Arizona). I shall try your suggested recipe posthaste, as I suspect it is wonderful – and I shall turn it back into patties (with your permission). Just thought I’d add that over here (the land of the cautious cook and eater) that it’d take you awhile to find a cook who even knew what shrimp paste was, and much longer to find one who had ever used it! Hi Doc, I loved reading your comment. I am smiling from ear to ear. You are a gem. But hey, I found one. You!! One last post to treat your tastebuds from our February Cook Book Guru. Glenda has treated us to some sensational looking meat and coconut balls that look like they’d be great for a sunday arvo beer or wine session with a few friends. Liz, it will be great to see your recipe. What an interesting recipe and I do admire how perfectly shaped those balls are. It looks like you did a variety of dipping sauces. Any in particular that went especially well with this? Hi Diane, a couple were mango based which went really well. I considered make these coconutty meatballs too, but run out of time. Good to know they are worth the effort. The bookmark will stay in place! Hi Sandra. I had fun last month. I do like the idea. Pity I don’t have this month’s book. Oh well I have April’s book.